Hey Hook Nookers, I’m back and am so excited to be featured again on The Hook Nook Life. It has a deep meaning for me, and I am so excited to share another BEAUTIFUL pattern with you. This one is by far my favorite! 2018 was all about learning to explore, create, try new mediums, and meet fellow artists. I have started having higher expectations for myself. I want to create beauty, something unique, and something that speaks from my heart. I want all of my designs to reflect my spirit and soul. 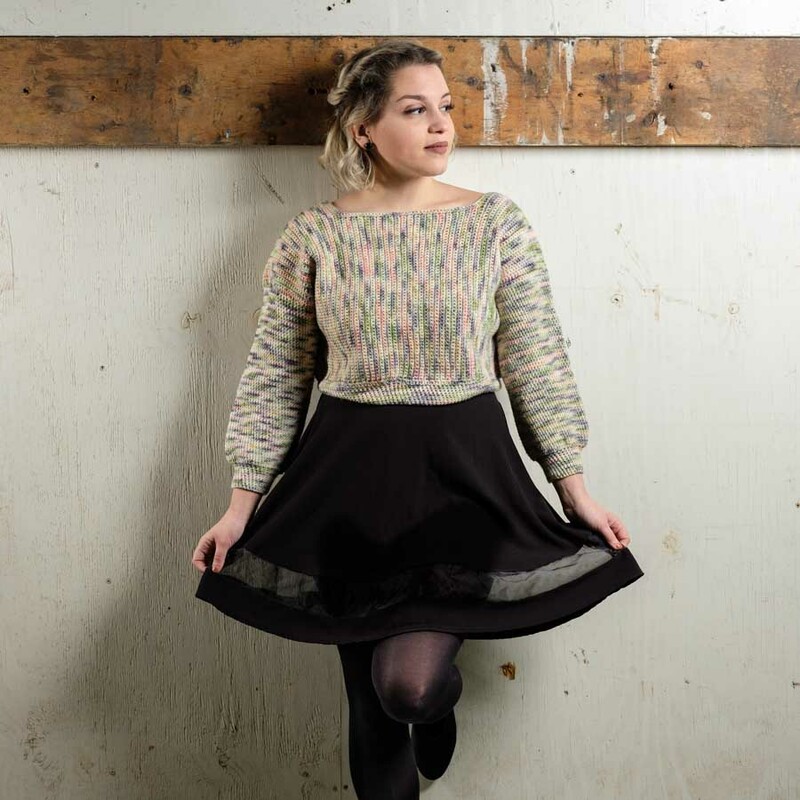 Daydreamer was a passion project that was born from a simple skein of yarn. 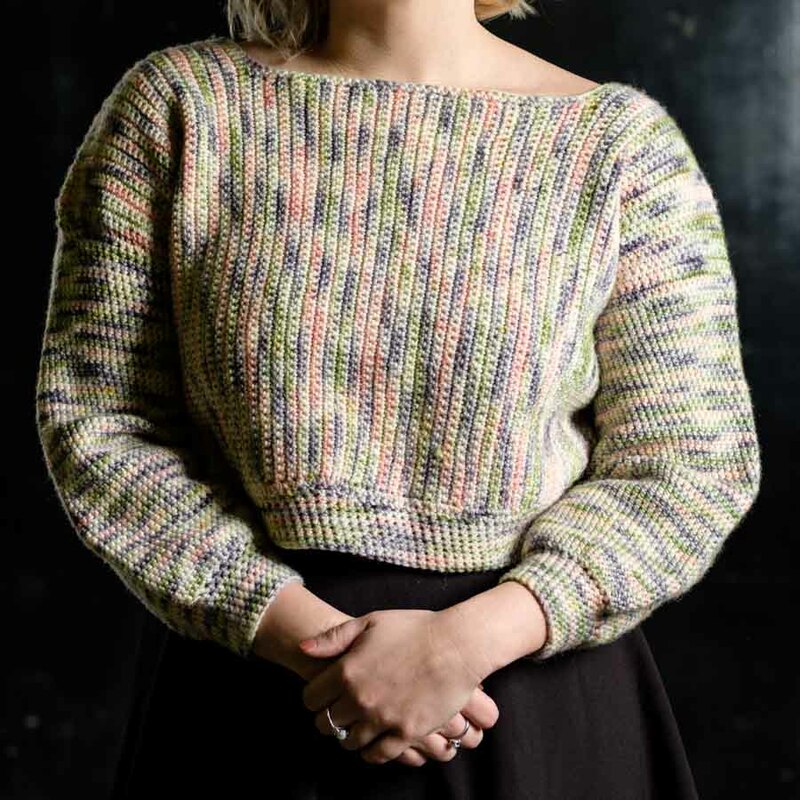 While visiting Syracuse, Lindsay from ThreadHead Knits had given me a skein of her “Daydreamer.” Like most maker relationships, we found each other on Instagram, I fell in love with her fluffy poms and vibrant yarn. Daydreamer spoke to me, it had the simple pinks and greens, but gave me that dark color I craved. Her yarn is carefully dyed, and the colors are just so unique that it is really hard not to fall in love! I was so excited to get my hands on it, but I was unsure what I wanted to make with it. I felt the colorway was so whimsical and magical; I didn’t want to make a scarf or hat, but rather something I could wear all the time and feel pretty in. As many of you know, the design process can be unpredictable. You picture the way you want something to look, but there are a lot of things that can go wrong~especially when it comes to me! I don’t really go into a design logically. I usually jump right it; I don’t do a gauge swatch, I don’t do any calculations, just hook in hand. I started Daydreamer, and she just flowed so effortlessly. I created the first panel and felt so confident. Not only because I was excited, but because I felt that this design is very different from my previous ones, and did not have any real issues. I continued onto the second panel and then the sleeves, it just kept building into this beautiful project and it just made me feel sooooo good! After blocking, and dancing around my house in my new sweater, I knew it needed a name. The colorway was the true inspiration behind the project, but the fact that this project made me feel so magical, pretty, and was effortless it only made sense to name it Daydreamer. I wanted Daydreamer to be a passion project that I could share, I had enjoyed working with Lindsay so much and seeing her reaction of the piece made my heart flutter. When it came time to take pictures, I knew that I would not be able to capture the essence of Daydreamer and really wanted something special. I had the unexpected pleasure of meeting local photographer Antonio Massa who’s art I had seen before. After seeing Daydreamer, he was able to bring my real vision to life. He was able to capture the emotion behind it, completely understand my vision, and make it feel moody, but magical. Daydreamer became our passion project, it was my design, but the collaboration to make it what it is today really has inspired me. I know it is just a sweater, but there is real beauty in the creation of art. I was able to work with four amazing people on this project which is an indescribable feeling! Huge thanks to my amazing testers and friends, Nicole and Emily for making sure this pattern is perfection. Please create a 4x4” square swatch using SC, (it should be 14 stitches by 6 rows) with your 5mm hook, and adjust accordingly if needed. Repeat step #2 until your piece is 6” (6.5”, 7.5). Repeat step #5 until your piece is 8” (9”, 9”). Note: Be sure that this row goes to the same height as the other side. This will create the “shoulders” of your garment and the neckline. Ch 1. SC across until your piece is 6”(6.5”, 7.5”) and finish off! Note: You may want to block your panels at this point before attaching, with SC your work may tend to curl depending on your tension. Lay both panels on top of one another and line up all edges to begin attaching. Start from the bottom working up the side, SC 22 (22, 22) to attach. Finish off. Repeat step #1 on the other side. Start at the edge of the “shoulder”, and SC 35(38, 43) to attach. Finish off. Repeat step #3 on the other side. Keeping your body inside out, attach to the top of your “shoulder”, SC 66(74, 84) around the opening to begin making your sleeve. SS to first chain to make a continuous round. Continue to SC in a continuous round for 11”(11”, 12”). SC in a continuous round for 2”(2”, 2”). Starting in the center of the bottom of your piece, SC around. Note: Make sure all SC around the bottom are even throughout. Ch 1. SC in one stitch, then SC2Tog in the next. Repeat. SC around for a total of 2”(2”, 2”). Finish off.